Police in Schools: Benefit or Liability? When my parents were in school, the halls were "patrolled" by P.E. teachers or vice principals. They were typically looking for kids loitering, chewing gum or sometimes, fighting. The sad reality is that times have changed drastically in the wake of high-profile shootings such as Columbine High School and Sandy Hook Elementary. Today, according to the National Center for Education Statistics, there are 43,000 school resource officers and an additional 39,000 security guards in the country’s 84,000 public schools. Though other sources say fewer. School resource officers (SROs) are sworn law-enforcement agents. They get to carry guns and make arrests. They were described by a congressional report as being "a hybrid educational, correctional and law enforcement officer." 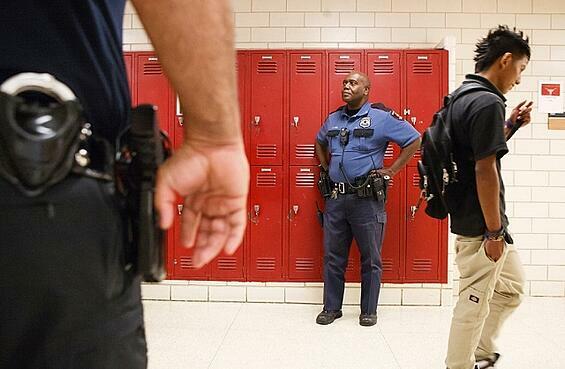 It shouldn’t be a surprise that armed officers in school hallways might be controversial. Though, these officers can also be coaches, lunchroom supervisors and perhaps even student confidants. Under the right circumstances, SROs with proper training are problem solvers and will direct students to helpful community resources. It’s the "proper training" that’s the rub. Mo Canady, executive director of the National Association of School Resource Officers, an organization providing instruction for school-based officers, is well aware of SROs mishandling situations—such as the one in South Carolina who slammed a girl to the floor because she wouldn’t leave her desk. Canady says, "The first thing I do is search our database to see 'Did this person come through our training?' And the answer is consistently "no.'" He also maintains that a 50-percent drop in school arrests, a stat he takes from a 2012 Department of Justice report, came at the same time more SROs were put in place. But such stats doesn’t tell the whole story, not by a long shot. Jason Nance, a University of Florida law professor, has studied the effectiveness of officers in schools. He found that students where police patrol the halls were 1.38 to 1.83 times more likely to enter the juvenile-justice system than those where there were no SROs. "Once a student is arrested, they’re less likely to graduate and more likely to be involved in the justice system later on," Nance says. "It’s traumatic for these kids, and some of them don’t recover." Critics argue that too many teachers and school administrators have come to rely on SROs for discipline and handling situations. Harry Houck, a law-enforcement analyst for CNN, says, "Too often, these teachers in these schools are calling on the cops because they have a disruptive student in the classroom. This is not a cop's job." "What teachers do now is call on officers and ask them to handle things," says Jim St. Germain, co-founder of Preparing Leaders of Tomorrow, a nonprofit mentoring group. "Handling" often leads to suspension. A Council of State Governments Justice Center study showed that a suspended or expelled student was three times more likely to be sucked into the system within a year. And that stands to reason. No longer in the structured environment of school, there is plenty of time to get into trouble. The question becomes do police in schools cause more harm than good? Especially since some civil-rights groups like the ACLU maintain SRO presence contributes to the school-to-prison pipeline. You’ll find dueling studies. One showing crime fell 50 percent over four years in Chicago. Contrast that to a national study that found no such drop, but rather more drug and weapons offenses. Another reports more police led to more disorderly-conduct arrests. Parents, let us know what you think. Do you know if police are in your child’s school? If so, do you feel students are safer? Have there been problems? For more information about factors related to school safety, visit our School Safety Resources page by clicking here.